CaF2 is used in frit preparation and as a low-fire enamel opacifier. It's value lies in the fact that it is an active flux and at the same time an opacifier. At higher temperatures the fluorine becomes volatile and is released as a poisonous gas. This happens as O2 combines with CaF2 to produce CaO and F2 gas. Even if the gas can be tolerated, the material slowly decomposes to evolve the fluorine gas, and thus is troublesome for use in glazes because of the blistering problems. 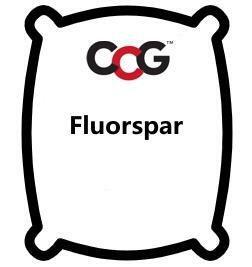 If fluorspar is being used as a source of Ca at higher temperatures to create CaO oxide in a glass there has to be an oxidizing atmosphere in the kiln to supply the needed oxygen. Fluorspars have varying amounts of iron contamination and can be very clean. Fluorspar generates gases that can produce vivid blistering for special purpose effects.